Freshmen students in a physics class worked in a classroom at Natick High School on Friday. Massachusetts dominated in the subjects of reading and science on a prestigious yardstick of global achievement last year, but saw its math scores slip, according to results released Tuesday. In many cases, performance on the Program for International Student Assessment exams turned into a showdown between 15-year-olds in Singapore and those in Massachusetts and several leading nations. The Bay State statistically tied for first in reading with eight other nations that earned similar scores: Singapore, Hong Kong, Canada, Finland, Ireland, Estonia, South Korea, and Japan. In science, Singapore was the only entity to statistically outperform Massachusetts. The PISA looks at bands of performance — rather than a specific score — to determine which countries scored at statistically higher rates than others. This is the second time Massachusetts has taken part to see how the state’s educational system stacks up against those in leading countries around the world. The state is seeking such data as it tries to build a larger and more highly skilled workforce to compete in a global economy. Math continued to be the state’s weakest area of performance, and the dip in scores dashed any hope that the state would gain ground in that subject. Eleven countries scored significantly higher than Massachusetts, with Singapore leading the pack — representing a similar outcome for the state on the 2012 PISA. However, the decline in Massachusetts’ math scores is not considered statistically significant because the number of students who took the test is notably smaller than those in other countries, making the results more volatile. More than a half million students in 72 countries, provinces, or cities took the two-hour exams, which are more commonly known as the PISA and have been administered every three years since 2000. The exams were developed by the Organization for Economic Cooperation and Development, which consists of educational leaders from industrialized countries. PISA aims to assess how well students can apply their knowledge of science, reading, and mathematics to solve real-life problems. Questions can range from how to raise fish sustainably to where a group of friends can meet up by traveling an equal amount of time in rush-hour traffic. Participation has a price: Massachusetts paid $630,000 to test 1,600 students in 49 schools statewide. Students are randomly selected to take the test, based on a representative sampling of the state’s population of students. Barbara Madeloni, president of the Massachusetts Teachers Association, questioned the need to spend money on another standardized test. Massachusetts and North Carolina were the only states to participate as their own entities. Massachusetts topped the national averages across the board by at least 30 points, while North Carolina’s scores were reflective of national averages. In science, Massachusetts scored 529 points on a 1,000-point scale; in reading, 527 points; and in math, 500 points. 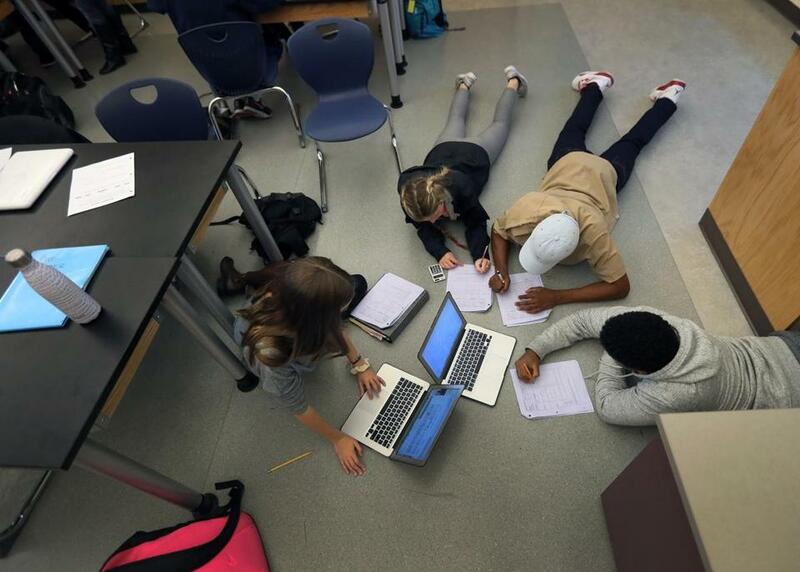 “Massachusetts and some individual schools across the US show there really is an American version of global education excellence,” said Jon Schnur, chairman of America Achieves, a national education organization in New York and Washington, D.C., that supports a learning network of schools across the United States participating in a school-based version of the PISA. But not everyone was fully enamored with Massachusetts’ success. Marc Tucker, president of the National Center on Education and the Economy, a research and consulting group in Washington, D.C., chalked up Massachusetts’ strong testing performance in part to its highly educated population and strong economy. He said states with low educational attainment levels may be better off looking to higher-performing countries with similar traits for ideas rather than to Massachusetts. Massachusetts’ decline in math performance — scoring 14 points lower last year than in 2012 — mirrored a drop seen for the United States, which has experienced years of sluggish math performance. That trend, coupled with a decline in math scores on another standardized test, the National Assessment of Educational Progress, has national policy makers questioning whether US schools need to rethink math instruction. The United States ranked 35th in math on the PISA. “I think we need to take a strong look at mathematics,” Peggy Carr, acting commissioner for the National Center for Education Statistics, said in a press briefing. Chester said Massachusetts is in the midst of revising its math standards with an eye toward placing a stronger emphasis on using knowledge to solve problems. US Education Secretary John B. King Jr., who was in Boston on Tuesday, called Massachusetts’ PISA results a bright spot, as he stressed the need for the rest of the United States to boost its performance. “Students in Massachusetts, Maryland, and Minnesota aren’t just vying for great jobs along with their neighbors or across state lines, they must be competitive with peers in Finland, Germany, and Japan,” King said during a visit to the Mildred Avenue K-8 School in Mattapan.